I love the name of this brand, though I think they should have said “Healthy food should taste good”! Because that’s exactly what they have done with their line of chips. I love that you can buy these products on Amazon, because unless you have an EarthFare or a Whole Foods around, you probably won’t be able to find them. They do come in bulk, though, so if possible find a store that sells them so you can try them before you order! Though if you do get them online and don’t like them, you should be able to return them. Remember, ordering through this link helps to support Erin Simmons Fitness! I wanted to share with you the findings from a recent study on artificial sweeteners. This study is making headline news and has come out of University of Texas Health Science Center in San Antonio, Texas. Basically, they found that waist size in diet-soda drinkers increased by 70 percent. And very frequent users (more than two drinks a day) saw 500% increases in waist size! Why? Researchers think that artificial sweeteners aren’t recognized by your brain in the same way. So when you drink something (or eat something) with artificial sweeteners hoping to satisfy that sweet tooth, your brain may not realize it’s actually getting something sweet and you tend to keep eating to satisfy that desire. Another result they found from testing on mice was that aspartame actually increased blood glucose levels, which is bad news for diabetics and people at risk for diabetes. So artificial sweeteners may not be the quick fix that diabetics should look to as substitutes for sugar. Something to think about! My opinion is, of course, to always eat naturally and just practice self control. Sugar in small amounts is fine, and it’s even better if it’s coming from fruit! So turn to lower calorie, naturally sweetened foods for your sweet tooth fix. My favorite: Fruitfull Frozen Fruit Bars! 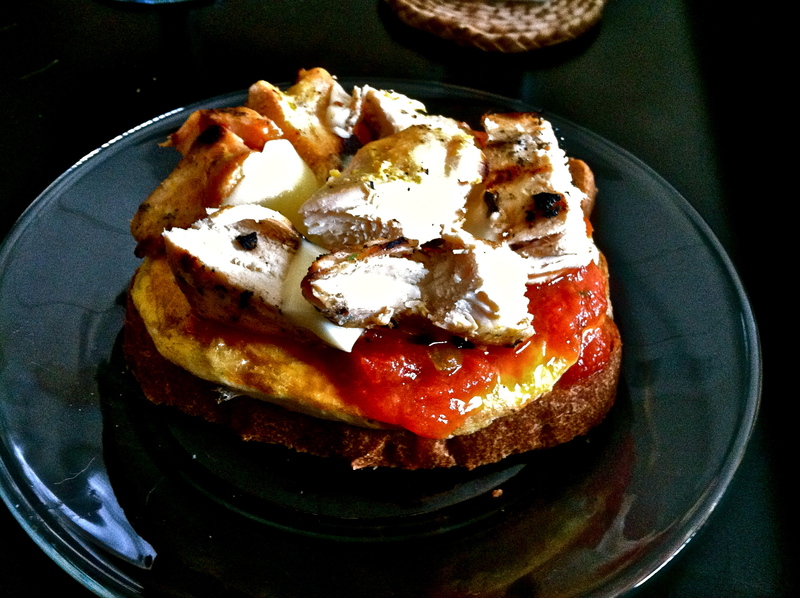 Toast your bread, cook your eggs, melt one Babybell on the toast and one on the chicken, and pile on the salsa! Easy day. My aunt asked me to come up with a gluten and dairy free weight management diet plan so I’ve been doing some research. As with all my diets, I will say that I am not a certified nutritionist, all of my advice comes from research and years of being an athlete. So if you need absolute professional opinion, see a nutritionist or dietician. So aside from being careful not to eat foods that contain gluten, you also have to be careful not to eat things that have been processed in the same place as foods that do contain gluten, which is probably the hardest part. So my suggestion would be to try to cut most of your carbs. Potatoes and rice are good staples, however, I would keep this to a minimum if you are trying to lose weight. Try to fill yourself up on veggies, fruits, and proteins, instead. Lunch: Salad with grilled chicken with olive oil based salad dressing (making sure it’s pure olive oil, no additives), fruit. If on the go, Amy’s has great frozen gluten-free foods, too! There are also plenty of websites with gluten free recipes and many companies are now coming out with gluten free products. So find foods you like and figure out how to make or buy them gluten free! And to end this post, here is a Q&A with someone who found out they had Celiac’s Disease and how he has worked around it and still enjoys life, including food. Great article! I get a lot of questions about diet, so I went to Mayo clinic to see what resources they had on a healthy diet. I do not personally believe in all the special diets that are out there as they tend to be “quick fixes”. Your diet should be a habit, not a trend. A diet should simply be satisfying the needs of the body with these major food groups, not starving yourself or cleansing your digestive system. The most important thing to remember is at the bottom of each one of the diet pyramids in this article: daily exercise! And it is also important to remember that diet and exercise always go hand in hand for a healthy lifestyle: you can’t have one without the other! So check out the article below as well as my sample diet plan!